Celebrate Valentines Day with a romantic audio-visual performance in a beautiful botanical paradise! Muriel Anderson’s audio-visual show is a must-see as well as a must-hear! Her world-renowned guitar and harp guitar playing is highlighted by a backdrop of stunning visuals by cinematographer Bryan Allen. Their current show “Wonderlust” includes music inspired by the Eclipse, and then brings you with them on a journey around the world in music, stories and images. 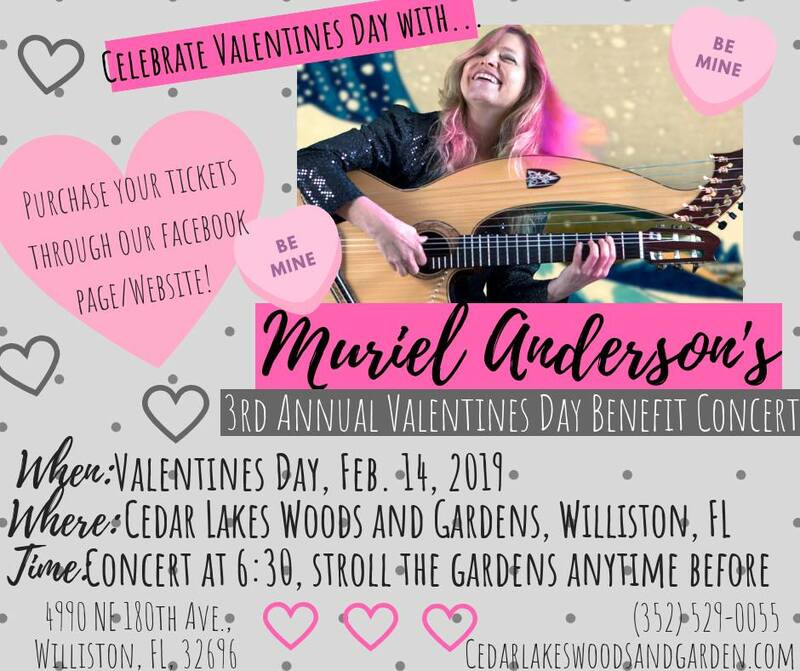 The first woman to win the National Fingerstyle Guitar Championship, Muriel has performed with country legend Chet Atkins, jazz great Les Paul, and continues to thrill audiences with her unique and joyous style. Enjoy listening to harmonious melodies with your loved ones among the 50 unique garden displays, cascading waterfalls, and incredible scenic views that Cedar Lakes Woods and Gardens has to offer. Tickets include garden entrance to Cedar Lakes Woods & Gardens during the day leading up to the concert. We hope you are looking forward to a romantic evening at one of the most unique botanical gardens you'll ever see!